I was out in my backyard when a scene unfolded in front of me. I don’t speak chirp so I couldn’t quite catch what was happening. I now look to you to decipher the events from the pictures below. Please tell me what happened. It would also be nice if each character had a name. If you are really feeling spry, some background information about the individual birds would be welcomed. 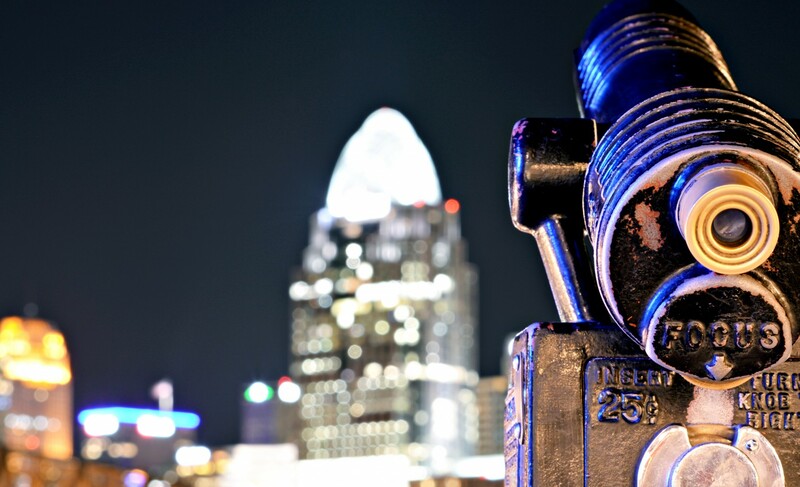 Your Story is a SethSnap series in which you get to decide the story behind the photo. You can write a story, a poem or even just one word. You decide. Put on your most cherished mu-mu, turn on your favorite Neil Diamond song and go! To see previous Your Story posts click on “Story Time” on the right. Maybe they were saying thank you for the food. Josef and Samantha decided to conquer the entire birdfeeder. It was a joint effort, but they were waiting so long that they enemy had already gotten bored and flew away. Still, they had the plan and decided to attack the thin air as a show of power. No matter where you go, I will follow…no matter how tiring the times, i will be your shadow..no matter how rough the days, I will tag along..no matter how far you go, I will be next to you..No matter how long you take, I will wait to be the partner for life.. 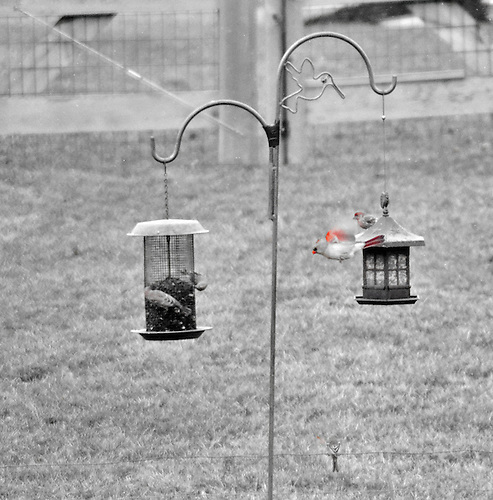 The finches were not about to let that mottled cardinal (and that was a problem in and of itself–it wasn’t a cardinal with true coloring–it was one with unusual coloring, so it had to be attacked) get at any of their food. And because it’s getting warmer, and we’re geting into nesting and mating season, territory wars naturally erupt. Voila! But you managed to get it on film–congrats! Bird One: Hey how’s it going. Bird One: Is it good? oh! who cares what they were saying! i am yet again stunned by your talent. this leaves ME speechless. El pinzon meets l’hirondelle in a beautiful garden after their long solitary journeys following the stars and magnetic fields. They couldn’t communicate in their different languages, but they slowly tried get to know each other until they decided that this magical place would be home. Cheery was hungry. She was perched on the shepherd’s hook, looking down at the feeders. She looked to the left. She looked to the right. 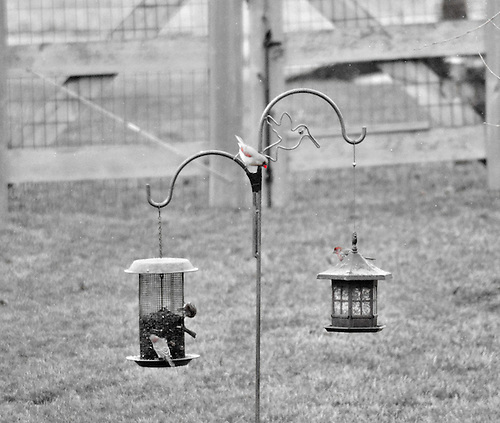 The feeder on her right had her favorite seed, but Snibbin, Dearling, and Beaujolais were eating there. Mavrodaphne was on her way over to the other feeder. Cheery looked down, watching her, and decided to join Mavrodaphne. Cheery chirped hello and said how much she really wanted the other seed. Mavrodaphne answered, “Me too!” Suddenly there was an invitation chorused by Snibbin, Dearling, and Beaujolais–“Join us!! !” –so Cheery and Mavrodaphne flew over to the other feeder. Their friends all shifted places to accomodate them and they had a lovely breakfast together. Aw, that’s nice that they all got along. Seth, you got me with your birds. 2- I’m too shy to join a crowded bar! 3-Here I go, it’s too bad to miss a party! 4-Ah, nothing beats making new friends. It’s been ages since I saw that film. Very good, but oh so depressing. 🙂 Thanks for the comment. Thanks for stopping by my blog. I adore your photos! I love that – I don’t speak chirp. Interesting processing you did for these images. I love just the red beaks! Todd, you were right. Adding these bird feeders has really livened up the back yard. Just look at these beautiful cardinals dance from one feeder to another. I can’t wait until you add the water feature! Well, these are actually my neighbors. We added a bird feeder to the front yard because the dogs hang out in the backyard as much as possible and the birds wouldn’t come near them. So many (all-you-can-eat-birdie) restaurants – so little time! Well, we’ll just eat and run cause we’re cutting in line! 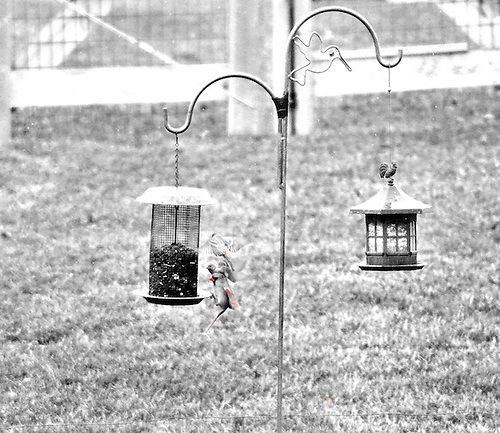 love the black and white with the color of the birds! Very good! Didn’t you hear what they put in that feeder? What!!!? What did they put in there? That food from that store, you know the one. Try the other feeder. It’s much better. Little sparrow was expelled from the feeder by the gang of North Zone. His only hope was to call SuperCardinal. Awesome. Love it. Thanks. Tell them thank you. Well done, An award for you!